Henri Marie Coanda (7 June 1886 - 25 November 1972) was a Romanian inventor, aerodynamics pioneer and the parent of the modern jet aircraft. With the support of engineer Gustave Eiffel and aeronautical pioneer Paul Painleve, he began experimenting the aerodynamic techniques: one of this experiments was mounting a device on a train running at 90 km/hour so he could analyze the aerodynamic behavior. Another experiment used a wind tunnel with smoke and an aerodynamical balance to profile wings to be used in designing aircraft. This led to the discovery of the aerodynamic effect now known as the Coanda Effect. In 1910, using the workshop of Joachim Caproni, he designed, built and piloted the first 'thermojet' powered aircraft, known as the Coanda-1910, which he demonstrated publicly at the second International Aeronautic Salon in Paris. The powerplant used a 4-cylinder piston engine to power a compressor, which fed to two burners for thrust, instead of using a propeller. M Wolf discovered asteroid #471 Papagena. NASA launched X-15A Local flow, M=5 Test mission # 56 in which civilian test pilot Joseph A. Walker flew to 31.577 km with a maximum speed of 5910 kph (Mach 5.39). NASA's Gemini 4 mission ended when astronauts James McDivitt and Edward White splashed down in the western Atlantic Ocean. Gemini 4, launched 3 June 1965, was the second manned and first long duration mission in the Gemini program, and carried James McDivitt and Edward White on a 4 day, 62 orbit, 98 hour flight. The mission included the first American spacewalk in which White also became the first person to use jet propulsion to maneuver himself in space while on a spacewalk. Gemini 4 was also the first mission to be controlled from the mission control center in Houston. The main objectives of the mission were to test the performance of the astronauts and capsule, evaluating effects on the crew of prolonged exposure to the space environment, and to evaluate work procedures, schedules, and flight planning for an extended length of time in space. Secondary objectives included demonstration of extravehicular activity (EVA) in space, conducting stationkeeping and rendezvous maneuvers, evaluating spacecraft systems, demonstrating the capability to make significant in-plane and out-of-plane maneuvers, demonstrating the ability of the orbit attitude and maneuver system (OAMS) to back up the retrorockets, and conducting 11 experiments. Gemini 4 was launched from Complex 19 at 10:15:59.562 am EST, and inserted into a 162.3 x 282.1 km Earth orbit at 10:22:05. The orbit was raised to 166 x 290 km during the first revolution to attempt a rendezvous with the second stage. The stationkeeping exercise was cancelled early in the second revolution: After depletion of 42% of the fuel (most of the OAMS propellant allocated for the exercise), it was determined that use of more fuel through further efforts would jeopardize primary mission objectives, and could mean the cancellation of several secondary objectives. The flight crew began preparing for EVA immediately after terminating the stationkeeping exercise. Although preparations went smoothly, McDivitt decided to delay EVA for one revolution, both because of the high level of activity required and because deletion of the rendezvous attempt reduced the tightness of the schedule. White donned special gear and pressurized his suit at 3.7 psi. McDivitt depressurized the cabin, bringing the pressure to zero at 2:33:35 pm EST, and the hatch was opened at 2:34, 4 hours 18 minutes into the flight. White stood up two minutes later and exited the spacecraft using a hand-held gas gun at 2:46, becoming the first American to walk in space. 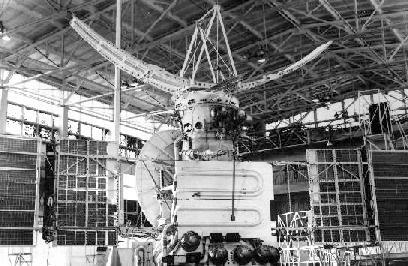 White was attached to the spacecraft by an 8 meter tether. The gas gun fuel supply was depleted in 3 minutes, after which White pulled on the tether and twisted his body to maneuver around the spacecraft. The extravehicular activity (EVA) lasted 23 minutes, after which White pulled himself back into the spacecraft. Difficulty was encountered sealing the hatch, but working together the astronauts finally closed it, at 3:10 pm EST. Cabin repressurization began at 3:12:50. The Gemini 4 space walk was hurriedly included after the Russian first in Voskhod 2. White seemed to have a lot more fun than Leonov. and McDivitt took the pictures that came to symbolize man in space. Drifting flight was maintained for the next 30 hours to conserve propellant. An inadvertent alteration of the computer memory during the 48th revolution in an attempt to correct an apparent computer malfunction made the planned computer controlled reentry impossible. A zero-lift ballistic reentry, similar to that used by the Mercury program, was started at the beginning of revolution 62 with retrofire at 11:56:00 am EST on June 7. Gemini 4 splashed down 16 minutes later at 12:12:11 pm EST in the western Atlantic at 27.73 N, 74.18 W, about 725 km east of Cape Kennedy, 81 km from the target. Total elapsed mission time was 97:56:12. The crew were recovered by helicopter 34 minutes later, flown to the aircraft carrier USS Wasp at 1:09 pm, and the capsule was recovered at 2:28 pm, a little more than 100 hours after Gemini 4 had been launched. The experiments performed during the mission were electrostatic charge (MSC-1), proton-electron spectrometer (MSC-2), triaxial magnetometer (MSC-3), two-color Earth limb photos (MSC-4), inflight exerciser (M-3), inflight phonocardiogram (M-4), bone demineralization (M-6), synoptic terrain photos (S-5), synoptic weather photos (S-6), dim and twilight phenomena (S-28), radiation (D-8), and simple navigation (D-9). All experiemnts were performed successfully. All other objectives except the rendezvous and computer controlled reentry were achieved. USSR Soyuz 11 cosmonauts Dobrovolski, Volkov and Patsayev boarded the Salyut 1 space station after successfully docking with it. A. Gilmore and P. Kilmartin discovered asteroid #3152. USSR launched the Venera 16 orbiter to Venus. Venera 16, launched 7 June 1983, was part of a two spacecraft mission (along with Venera 15) designed to use 8 cm band side-looking radar mappers to study the surface properties of Venus. The two spacecraft were inserted into Venus orbit four days apart, Venera 16 arriving second on 14 October 1983, with their orbital planes shifted by an angle of approximately 4 degrees relative to one another. This made it possible to reimage an area if necessary. Each spacecraft was in a nearly polar orbit with a periapsis at 62 N latitude. Together, the two spacecraft imaged the area from the north pole down to about 30 degrees N latitude (i.e., approximately 25% of the surface of Venus) over the 8 months of mapping operations. In June 1984, Venus was at superior conjunction and passed behind the Sun as seen from Earth. No transmissions were possible, so the orbit of Venera 16 was rotated back 20 degrees at this time to map the areas missed during this period. USSR launched Soyuz TM-5 from Baikonur to the Mir space station with cosmonauts Solovyev (USSR), Savinykh (USSR) and Aleksandrov (Bulgaria) aboard. USSR launched Soyuz TM-5 on 7 June 1988, transporting to the Mir orbital station a Soviet/Bulgarian crew comprised of cosmonauts A. Y. Solovyev, V. P. Savinykh and A. P. Aleksandrov (Bulgaria), to conduct joint research and experiments with cosmonauts V. G. Titov and M. K. Manarov. It initially entered an interim orbit 343 x 282 km, then maneuvered to Mir's 355 x 349 km orbit. Soyuz TM-5 docked 15:57 GMT 9 June to Mir's aft port, and was moved to the forward port on 18 June. Soyuz TM-5 undocked from Mir at 22:55 GMT 5 September 1988, and jettisoned the Orbital Module at 23:35 GMT. The planned landing at 02:15 6 September failed due to confusion of the infrared horizon sensors. The repeat retrofire attempt one orbit later resulted only in a partial burn. The crew had to spend a tense 24 hours in the cramped Descent Module (the Orbital Module having already been jettisoned before the retrofire burn) before making a last chance to deorbit. Finally Lyakhov and Afghani cosmonaut Mohmand (Soyuz TM-6) returned safely to Earth, and landed 00:50 GMT 7 September 1988, 160 km SE of Dzhezkazgan. NASA announced termination of its Orbital Maneuvering Vehicle Program. A DC-XA test mission was launched which reached an altitude of 590 m during a 64 second flight, experiencing maximum structural stresses with a 50% full LOX tank. USSR launched Cosmos 2344 (Araks 11F664) on a Proton-K, a 20 ton imaging reconnaissance satellite. Half of the rechargeable batteries and one of three channels in the onboard flight control computer failed at separation, the mission lasted four months.